No, it's not one of the most famous trios in pop music history, it's their equine counterparts: the Gee Gees. Click here to play! Get on down to this rocking slot today for your chance at incredible cash jackpots! 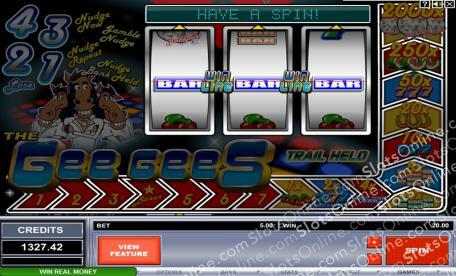 The Gee Gees is a traditional 3-reel slot played across a single pay line. There are no Wilds or Substitutes; instead, on certain winning combos you will be rewarded with the ability to Nudge, Hold, or Trot On your reels. There is also a lucrative Bonus Game that can pay out up to 2000 times your initial wager. To enter the Disco Dancefloor Bonus Room you simply have to earn a win on any spin. Once inside, you will be able to spin up a number and move along the board for a handful of unique game prizes. Get your groove on today with The Gees Gees slot machine, and win yourself some incredible cash payouts! The Disco Dancefloor Bonus Game can be activated whenever you have a win on the reels. Once inside you will spin the reels for special prizes until you lose or collect!